In the adventures and misadventures of an oenophile there are moments that mark our journey, and this is almost always because of one or more unforgettable wines. I can’t think of anything more exciting than literally come face to face with a preciousness and make way discovering its history. That’s exactly what happened to me with two rare specimens from Frasqueira de António Porto Soares Franco, whose wines are part of the Soares Franco family’s assets located in the headquarters of José Maria da Fonseca, more specifically in the Adega dos Teares Velhos. Going back to António Porto Soares Franco’s time, who at the time was a partner of the Companhia de Aguardentes da Madeira, the routes to the Madeira island opened many doors and opportunities for business, that’s where the Abudarham name comes in. Consulting the book “Madeira: The islands and their wines by Richard Mayson”, we can learn that Joseph Abudarham had dual citizenship, English and French, and that he arrived to Madeira in the first half of the XIX century. He settled there in the wine business, with access to the best that was produced at the time, but also in the cash loan business, which would later give rise to the Companhia de Seguros Aliança Madeirense. His wine business was centered on bottled wine and was sold mainly to France and Germany. 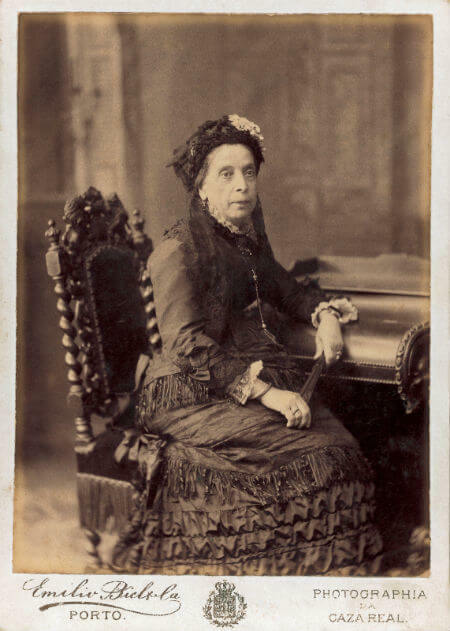 After his death in 1869 the company was renamed to Viúva Abudarham & Filhos and would eventually be sold to the Madeira Wine Association, which is today the Madeira Wine Company. Now that I knew its source and its merchant, the only thing left to observe were the details in the small tape stuck to the bottle, the permanent ink on the label could barely be seen and faintly indicated 1795. After some research and exchange of data I came to conclusion that the wine in question was a Terrantez 1795 of which several bottles were auctioned some years ago. The cork came out with the strength of the blades, intact and with the brand José Maria da Fonseca, a sign that the corks are changed every x years, something that was confirmed by the producer himself. The second bottle tells a different story, thus bringing us to the Port wine. It also boasts the Frasqueira Soares Franco name and the label only shows R.M 187X. Given the age of the two bottles time has taken its toll on the labels and with them their precious information. In the case of the Madeira they saved up the date on a paper tape, and in the Port wine’s bottle there’s something left on the back label. Later I confirmed that the initials refer to Ramiro Magalhães, a former Port wine merchant who lived in Bombarral. Ramiro Magalhães was an important man in his land and a great wine dealer that at his time would have been one of the firsts to have car and driver. On the back label we can see the missing number, thus getting the vintage’s full year, 1878, the last pre-phylloxera year. In this case there won’t be much more to say, the remaining information only references the year in question, which was considered classic Vintage year. 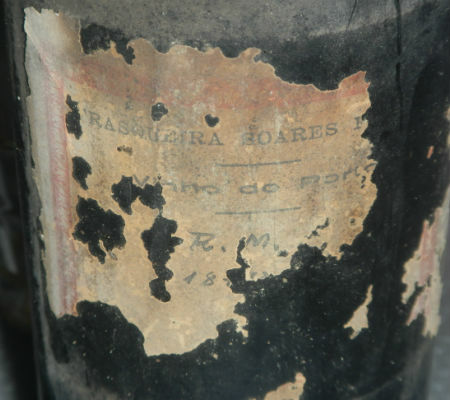 Frasqueira Soares Franco – Abudarham – Terrantez 1795: It’s amazing the ability that this wine has to perfume a whole room. As soon as it falls in the glass we get mesmerized by the shades that glow in the glass, a wine with 221 years showing the reason why even after all of the wines are served during the dinner, when the Madeira comes in it’s the king of the party. In this case the wine is breathtaking and unforgettable. First of all, a slight peak of volatility before conquering us with a warm and cozy tone of caramel, vanilla, toffee, preparing us for the next clash, a huge freshness. And it’s that same freshness that dominates us and leaves our hands attached to the glass. A WOW comes out immediately, it’s like those rollercoasters that we just want to keep on repeating. With this wine it’s the same, it’s a comes and goes of sensations, the aromas stuck in time go bouncing off the glass, there’s a slight sensation of unctuosity full of freshness, and in the background something that recalls the smell of cigar ash. The palate is another struggle, a conquest that holds us with caramel and burnt sugar, slightly rounds up to the point where we almost crack it, and then fires up in a crazy spiral of acidity with slight bitter in the aftertaste. Unforgettable. 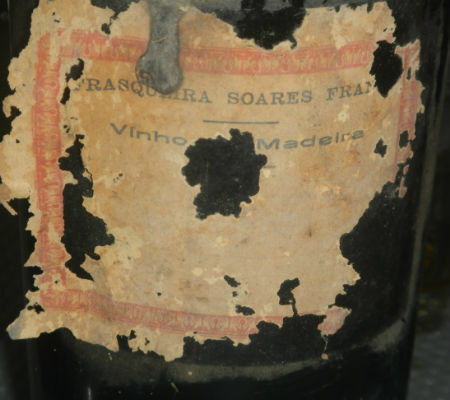 Frasqueira Soares Franco – Ramiro Magalhães – Vintage 1878: A Vintage with 138 years of life. Yes, I said life, because although the tone reminds me of an old tawny its freshness and aromatic definition are remarkable. Very precise and delicate, great elegance with aromas of sweet tobacco, fine spices, candied orange peel, raisin fruit with dates, a cozy set and slightly unctuous. On the palate comes greedy, unctuous and with good volume in the mouth, a slight of vinagrinho, it’s almost like a sweet and cool marble that tears itself on the palate until it remains only a thin, long finish. Majestic. I have indeed a big crush by Port wine, and more specifically by dated Tawnies. The ladder or path of temptation and damnation that the 10, 20, 30 or over 40 years represent, is for me a paradise without end. I admit that my wallet does not allow me to enjoy the heavenly pleasures and all the exclusivity that an over 40 years gives us. But I can also say that I get quite satisfied with the more affordable pleasures that 10 and 20 Years provide. Well, with this in mind I have to bring to conversation the newest recent releases of a producer that has already been approached here, Blackett. In fact, it becomes difficult to have to go down the stairs because once we’re up here it all looks more beautiful and graceful. The luxuries of a 30 Years Port are quite different, and who likes to give them up? The presentation of the producer was approached in the previous article when I focused on the Blackett 30 years. This time I changed the twists to the game, if it was even a game, and I started the tasting with the Blackett 10 years, a style in which was expected to be the fruit to appear in large numbers like in other houses, but not here, the fruit eventually comes but we can notice that the evolution and even the whole blend that was built around there has a slightly more evolved bouquet and that is good, very good. So we’re before a 10 years that appears to be a little older, sweet-tooth and fresh, with greatly involving and a great definition of flavors. The fruit is present in its most macerated touches, raisin fruit, a good unctuosity combining with dried fruit and a buttery touch. On the palate shows up very fresh, complex, with a beautiful balance between fruit/unctuosity/ freshness/sweetness, in a long finish. It is the golden key to end in beauty a meal with friends, family or even that late evening when the calm has already taken over. Ending in beauty with the 20 Years, which I dare to say that it was the one I liked the most from this trilogy of Port Blackett, even more than the 30 years. Perfect balance between the energy of youth and the wisdom that only comes with age. With all of this the end result could only be very good. A greater presence of dried fruit with a touch of caramel, broad and unctuous, very fresh, showing an ability to captivate us more and more. The palate conquers us thanks to the harmony it displays, slightly drier but with a more lasting presence. It’s a 20 Years Port of high level that goes directly into my lot of favorites wines. It’s one of those wines designed to accompany our own private moments, on the couch listening to our favorite CD or reading the book that catches our attention or that series we follow religiously the end of the night. At every curve of the Douro there seems to exist a Quinta or a special location. It’s a river with charisma, a valley where nature and man have joined in creation. In the twists and turns, heights and riverbanks, in the way of facing the sun and in the wide range of varieties is written a great book. Not everything deserves to be character or chapter, but it’s a sheaf. The Quinta Dona Matilde has the right to enter history. If I use the book picture is because there’s a plot about this property. This domain belonged for four generations, to the Barros family, who bought it in 1927. In May 2006, Manuel Ângelo Barros sold the Barros Group to Sogevinus Group. 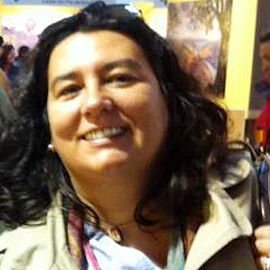 Quinta Dona Matilde was in the package along with the other assets. However, the wine is an imp and soon started to pester the entrepreneur who had sold the property. Thus, Manuel Ângelo Barros and his family decided they had to go back to the wine. So many turns and they ended up buying back Quinta Dona Matilde at the end of 2006 – the remaining assets remained in Sogevinus. The Quinta is located in Canelas, between Peso da Régua and Pinhão, within the initial demarcation area of Douro, established in 1756. All the wine area, 28 ha, is classified as Letra A (letter A) – the highest rank of the scoring table by the Instituto dos Vinhos do Douro e Porto – IVDP. In addition to the vineyards, Quinta Dona Matilde also has a traditional olive grove, an orchard, where stand out the lemon and orange trees, gardens and land left to nature. All this adds to the total of 93 ha. 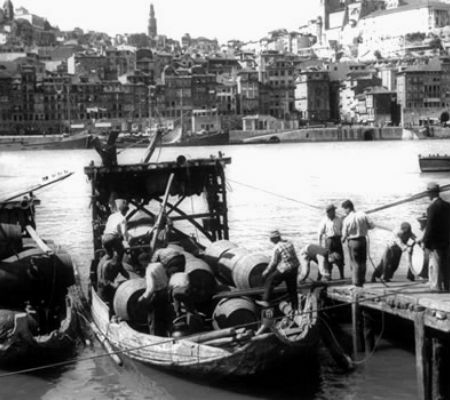 Port wine has always been the destination of this Quinta’s grapes. A small part wasn’t fortified, but it was only for family consumption. In the 60s, the company produced a rosé and, in the 90s, a white – but always marginal. 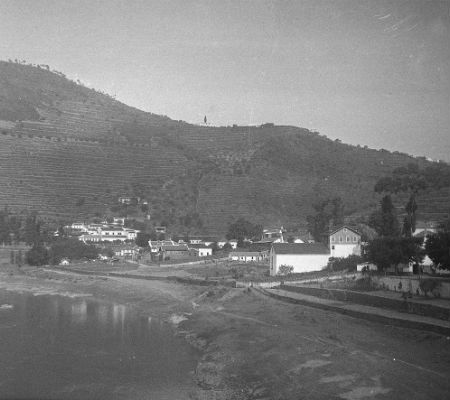 In family reincarnation, the Douro wine production is side by side with the production of Port Wine. Currently they are selling the grapes to the group The Fladgate Partnership. 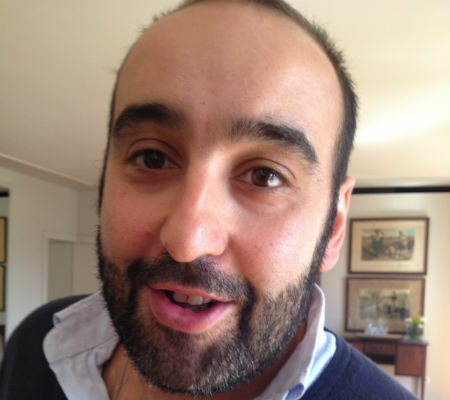 Manuel Ângelo Barros says that he in no hurry to put the wines for sale, a rare decision in Portugal. Now they presented the 2011 vintage, related to reds. The presented white is from 2015. The tradition of this house was to make tawny ports and it will be, although the manufacturing of nectars with age indication is, for now, put aside. They decided to focus on the Rubies, namely vintages. 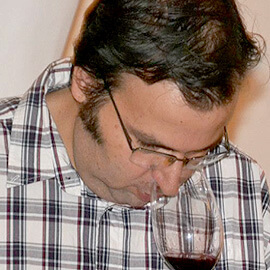 The viticulture is in charge of José Carlos Oliveira and the enology in charge João Pissarra. Dona Matilde White 2015 is a blend made with the grape varieties Arinto, Gouveio, Rabigato and Viosinho. The grapes were pressed and the wine was fermented in stainless steel vats. Because of the mountainous terrain and a river cutting it, the Douro region is generous in variety of features. However, this wine surprised me, because I never would say that this is a nectar from this region. I’m not a fan of making a sensory descriptors list, but it is justified to do so now, so that I can tell why I do not find the Douro in this white. It’s a wine where tropical fruit scents prevail, especially pineapple and passion fruit, combined with anise, a pinch of fennel, mandarin and a little lemon. 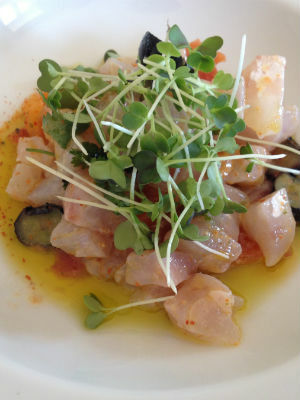 In the mouth, the tropical nature stands out. It goes on and on and with freshness too. And this that I’ve just written is good or bad? It’s a well-made wine – good! In terms of personal taste, it does not satisfy me. Then I wonder if this tropical and unpredictable profile is natural or if it was a will of the winemaker and the producer. If it’s solely the result of nature, I won’t speak a word. 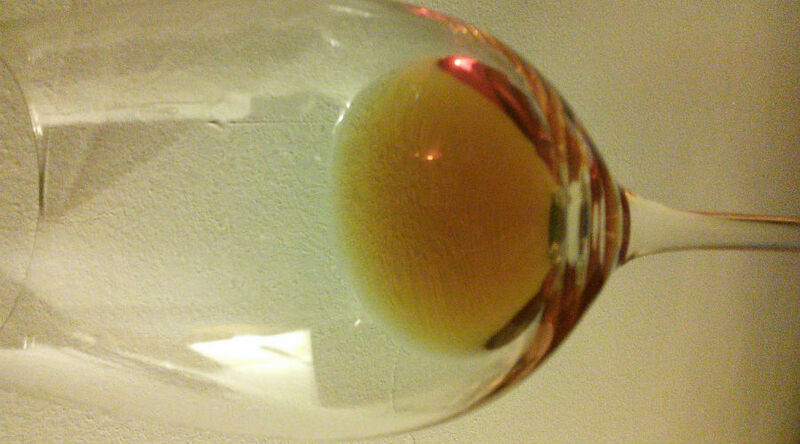 If it is intentional, I say I can see the reason for the Douro to produce wines with this profile. The Dona Matilde Red 2011 is clearly a Douro and exemplary of the year. It’s a blend of Tinta Amarela, Touriga Franca and Touriga Nacional – all from old vines, as indicates the producer. Part of the grapes were trodden in lagares. The wine aged for a year in wood. It’s sweet tooth without being sweet, soft, fresh and has good mouth-time. Minty aroma and a very smooth smoked holm oak firewood. Beautiful! Dona Matilde Reserva Red 2011 is a blend in which the Touriga Nacional represents 50%. Then we have Touriga Franca (30%) and a bouquet of various other, mixed in an old vine, where the Tinta Amerela prevails. Part of the grapes were trodden in granite lagares. The wine aged 18 months in new French oak barrels. It’s the Douro well shown: rock rose, mint, wood and holm oak wood smoke, black plum, blackberry jam, strawberry jam (calm and soft), figs, a little of blond tobacco and shale – all happily married. In the mouth continues to be Douro, fully occupies the space, smooth, with tannins laughing (without biting the skin), fresh and dry, long and deep. Before moving to the generous wine, I want to note that these three wines ask for table. The reds give hopes of good evolution in the bottle. The Quinta Dona Matilde Porto Colheita 2008 is not an ordinary tawny, halfway Ruby. It’s the result of less time of aging in wood. Three years in oak barrels and four in barrels of 600 liters. It’s a happy and pleasant surprise wine. It has what is expected of a tawny and resembles a ruby. There are dried fruit, caramel, vanilla and a pinch of iodine. Along with the blackberry, plum, cherry, and strawberry jams… It’s deep and dense, long. The Quinta Dona Matilde Vintage 2011 is further proof that the year was very generous to the Portuguese winemakers. It’s a blend of Tinta Amarela, Tinta Barroca, Rufete, Touriga Franca and Touriga Nacional. The wine aged two years in oak barrels, having then been bottled. There are again the many jams that liven up the vintage, from the nose to the mouth – deep and long. The new Vintages are what they are, but they will also be something else. They should be drunk now or be saved? I do not know! I do not know if I’m alive tomorrow. I know that if I stay awake for more years, the wine will be better. Those who can, drink and save it. I may be repeating myself but I’ll say it again, in a country like Portugal, which has unique heritage and manufactures some of the best things in the world as far as fortified wines are concerned, it pains me to know that there isn’t even an updated edition written by any of the national experts on Port wine, Madeira wine or Moscatel de Setúbal. 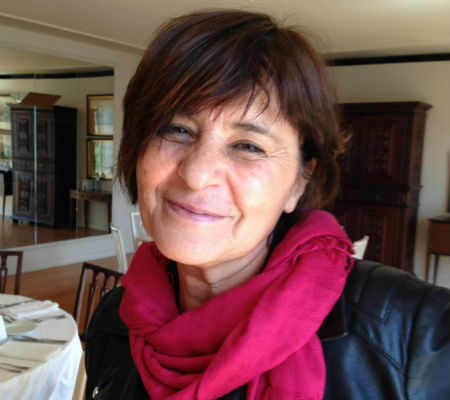 But in this specific case I’ll write about the Port wine and the Douro, and once again we have to thank those who come from abroad and have many decades of accumulated experience writing about Portuguese wines. 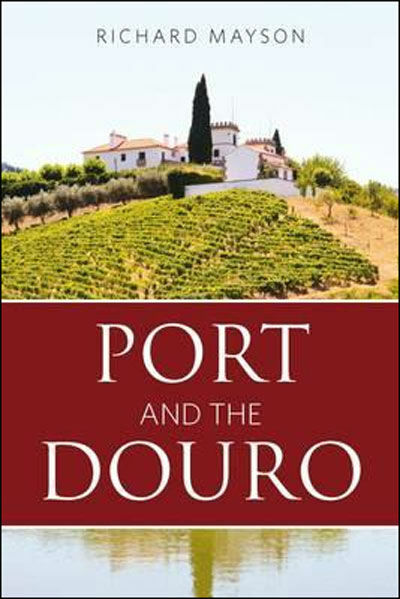 The author is Richard Mayson, well known for works such as Portugal’s Wine and Winemakers, The Wines and Vineyards of Portugal, and is now releasing a new edition of his bestselling Port and the Douro. 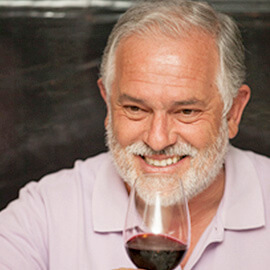 In addition to being a wine producer (Sonho Lusitano) in Portalegre, Richard Mayson is a profound connoisseur of Portugal’s wines and an expert in the fortified wines area. I’ve already approached and written about his recent book dedicated to the Madeira wine in a recent piece. This time he decided to release a new edition of the Port and the Douro, a work resulting from many years of work, visiting producers and tasting with them side by side. The outcome is at plain sight, once again with a beautiful book that shows us the fantastic world of Port Wine. It’s a complete journey where nothing seems to fail or be forgotten, from the history of the region as it started, to the winemaking process and the types of Port, through the various Quintas, vineyards, or through the various native grape varieties of the region. The various illustrations and maps are a precious help that help us to locate and realize in captivating way what we are being given to know. The part dedicated to the vineyards, as the whole book, is an example of the easiness with which Richard Mayson conveys his knowledge, as well as the all notes and curiosities that he highlights along the book and the part dedicated to the Homens que Moldaram o Douro (Men who have shaped the Douro). 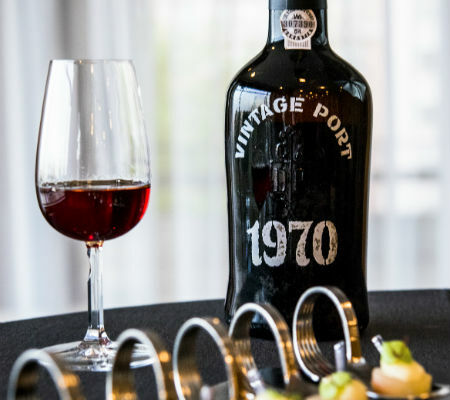 The book ends with a large section dedicated to the Vintage Port that is available for free, as a Vintage Port Guide, and has already been a chronic target. Although there is now an updated version, which is a great asset and helps to better understand what features each year with reminders for each vintage, since 1844, the oldest one tasted by the author, up until 2015. We can still find a few brief notes on how to save, age and serve Port wine, ending with some brief notes on the main producers. A book in the image of Port Wine, delicious. The aim of this initiative is for the Port Wine consumption to become a habit at mealtimes or even outside it. 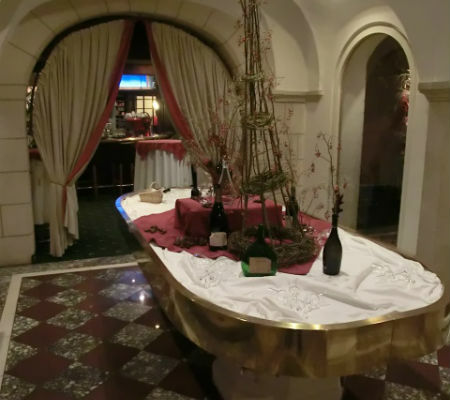 The implementation of this “movement” involves the creation of Port wine lists with their matching suggestions, which can be wine pairings of Port wine with cheeses and chocolates, and on a non-gastronomic side, with cigars, among others. 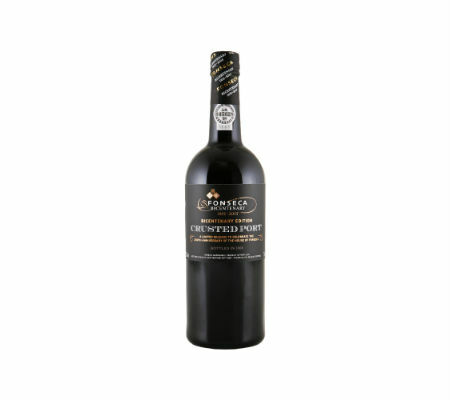 The offer will be adapted to the places of where it will be available, and the range of Port wines with the Real Companhia Velha’s signature is broad. 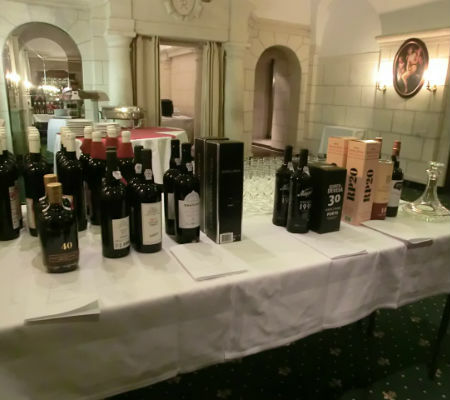 For this demonstration they were presented in a very interesting harmonization of several Port Wine styles with varied combinations and moments. The first two wines to be suggested show all their versatility and are an excellent door to the fantastic world of Port wine, with more affordable prices for the consumer who in this way is able to access and enjoy them at home without making big investment. 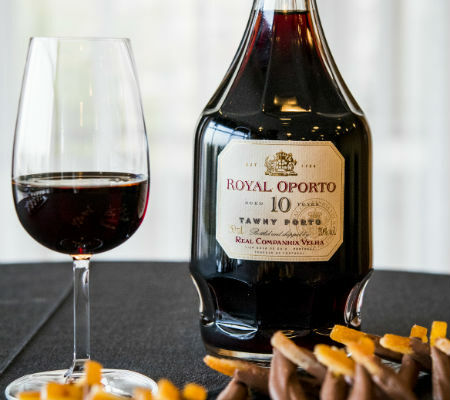 In this mano a mano, the Royal Oporto Tawny 10 Years showed up fresh with a balanced and sweet profile, with no great exaltations and a strong raisins aroma, resulted fully with the proposal. The Royal Oporto L.B.V. 2011 shows the vigor and energy of the Ruby style, full and opulent, fully coats the palate with wild fruit flavors, plenty of strawberry, blackberry, raspberry, in a fresh and spicy background. A more versatile wine showing enough energy to be paired with a good cut of beef just off the grill. The last wines to enter the scene were three Vintages in adulthood, breathtaking and memorable. From the proposals that were put on the table I discarded the one that referred to the cigars. All the wines that I speak of here were harmonized with cheese, either with Queijo da Serra da Estrela or with Stilton. The first one was the Real Companhia Velha Vintage 1970 with stuffed pear-rock and Queijo da Serra, a very engaging Vintage that got to me immediately with notes of caramel, fresh fruit mixed with dried fruit, flowers and a slight of balsamic. Beautiful presence in mouth, very good freshness with presence coating the palate, full of flavor and very good persistence, with enough energy for the clash with the Queijo da Serra where the acidity cuts the fattest part of the cheese while the greasiness feeling combines beautifully with the fattest tone left. 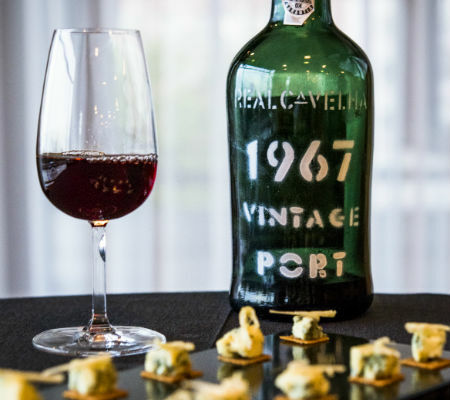 For the second moment, with Stilton cheese, crackers of spices and dehydrated Granny Smith, it was served the Real Companhia Velha Vintage 1967. If the previous Vintage had already got me with its charms, what to say about this one that to me shows up even better, a treat for the senses. Huge elegance and freshness, milk caramel, unctuous, conquering immediately. Rich complexity, all very nice and neat, serious, broad and persistent on the palate, very tasty with great persistence. Even with the Stilton’s power the Vintage 1967 proved to be a true colossus, shouldering side by side in a classic combination and again showing the will that these wines have to be at consumers’ table. I end with a wine that was intended for smokers, I chose to pick up the Real Companhia Velha Vintage 1957 and try to make a harmonization with the two proposals that had already been made. It showed up incisive and razor-sharp, much more fresh and less grease than the previous, which two make it a wine suitable for cigars. However, it was with the Silton that I liked it the most, and that demonstrates the versatility of Port wine in its most distinct styles and the ability to be matched with meals as well as to more festive moments and moments of pure relaxation. Shall we meet at 5:00 for a glass of Port wine? Peace finally came to Europe on June 18, 1815 after Napoleon was defeated at the Battle of Waterloo by Arthur Wellesley. The emperor was sent to the Santa Helena island in the mid-Atlantic South… His time there was nothing like the easy times he experienced during his captivity at Elba island from where he evaded to resume the war. 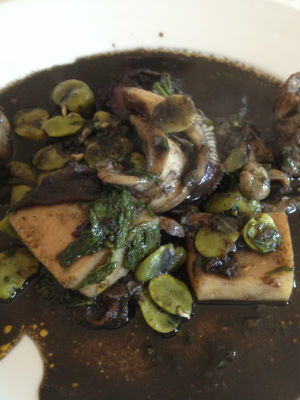 The emperor lived terrified by the possibility of being poisoned … I’ve always heard people say that the French cuisine is sublime and that the English is flawed – I don’t take sides. He was so cautious that he didn’t even drank the Madeira wine that the British consul offered him at time his ship connected in Funchal… But I think it was just pure chauvinism. Like it happens at the end of every war the society was a mess, many uncertainties and opportunities. On April 8, 1815, João dos Santos Fonseca bought 32 casks of wine. 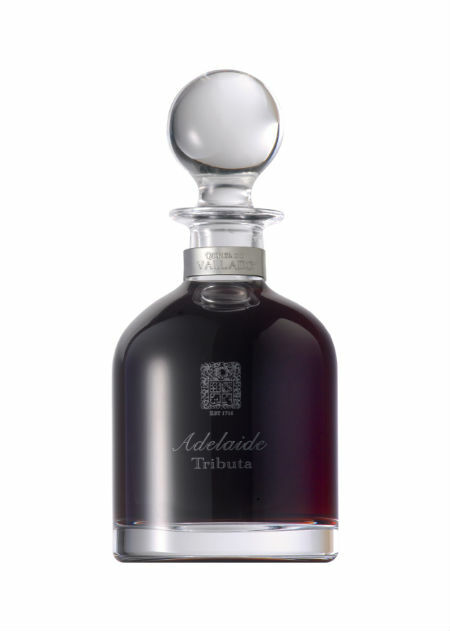 To celebrate the bicentenary it was released a Crusted Port, a blend wine of different vintages. The stakes were high because battles were still being fought across the Pyrenees. Mr Fonseca was financed by the Monteiro family. Later the Guimaraens and the Yeatman joined in. This aggregate has managed the house till our days, Alistair Robertson being the head of the house, descended Yeatman. There are “things” that evoke those times, like the Monument to the Peninsular War (Napoleonic war) in Avenida da Boavista in Porto, where the English lion subdues the French Imperial eagle – but it’s a piece conceived in 1909 that was only built in 1951. The French and Spanish armies invaded Portugal in 1807. The French came again in 1808 and 1810. The Iberian Peninsula’s conflict ended in 1814, after the Spanish Independence War. In Lisbon, the invasion produced long term consequences. 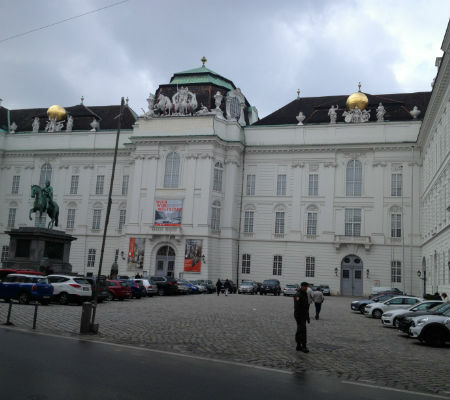 The 1755 earthquake had destroyed the royal palace. On the Ajuda hill was built a temporary house, Real Barraca or Paço de Madeira. The arrival of the French made the royal family flee to Brazil on November 29, 1807. When they returned home, in 1821, the world had changed. Even though King John VI was not born by time of the 1755 earthquake, he was born in 1767, he lived terrified with earthquakes, so he kept living in the Barraca. After a fire, the Ajuda Palace was started to being built in 1795 but never finished (only about a fourth is built) because the independence of Brazil, in 1822, closed the tap that flowed the gold as water; he no longer could afford to finish the house. Back to the Fonseca family… the first Vintage was in 1840, a decade of other nectars with the same status. The house of the family was located in Pinhão that is nowadays the Vintage House Hotel. In October this year, The Fladgate Partnership (Fonseca, Taylor’s, Croft and Wiese & Krohn) bought the hotel. The house returns home. The Fonseca Guimaraens Vintage 2013 was released this year. This is a designation that comes in years that are not considered as classic years. Made of grapes from Quinta do Panascal, it shows itself smooth, gluttonous, with a complexity of fruit jellies, where blueberries and blackberries stand out. This wine calls out to a chocolate mousse with two days, one of them being kept in the freezer. Drinking it now warms my hearts but stings my mind. Keep it and wait… My heart might not handle it. 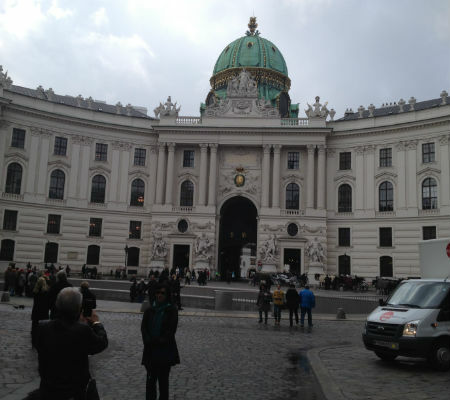 Vienna is a very beautiful city with monuments that bring you back to times of splendour, and where culture is all around, as the music of Wagner, Bethoven, Mahler, Mozart and many others fills the air. 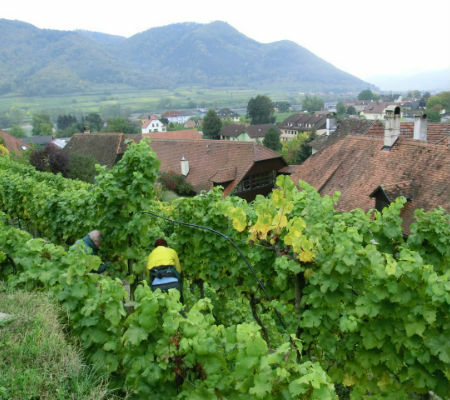 I also paid a visit to the Wachau region – still in harvest season at the time – to taste a few great white Austrian wines made from the Geunner-Weltliner and Rieseling grape varieties, and to compare them with the whites we have in Portugal. 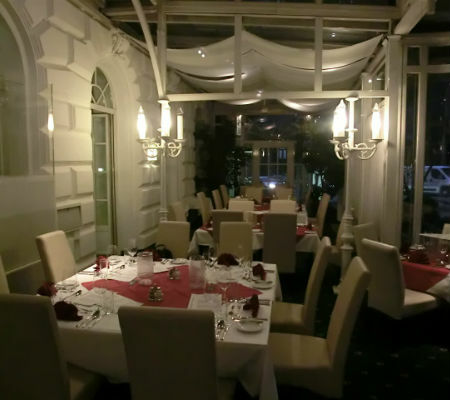 On the day of the tasting, we visited the facilities, which had been managed by one of the finest restaurants in Vienna for a long time; it was eventually moved when they transferred the venue to a hotel management school. 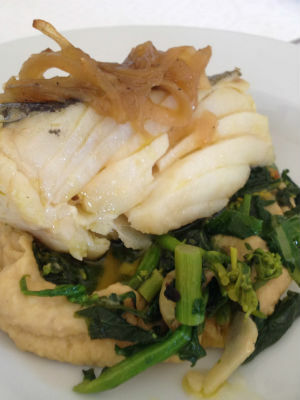 In the very comfortable and high quality facilities, the school’s chefs prepared the meal, and the students performed the service under the guidance of the dining room teacher. In the meantime, the white and rosé wines were being chilled and the reds were stored in a room at a temperature cool enough for serving. My friend, Dr. Manuel Alexandre, a brother who has been based in Vienna for many long years, was a representative for ICEP (Institute for Portuguese External Commerce, now AICEP) for a long time. 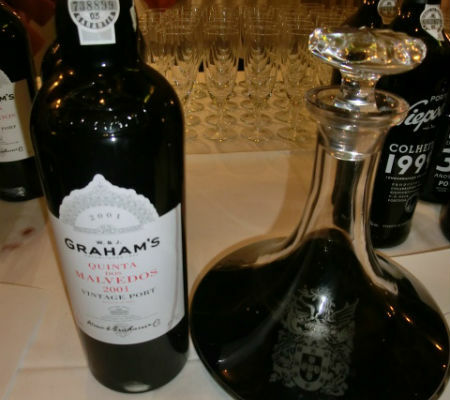 He brought along a beautiful old official decanter by IVDP (Port and Douro Wines Institute), that we used to decant the Graham’s Vintage 2001, which already revealed quite a bit of sediment. The interns had been given simple instructions, enough for them to clearly understand what was intended, and the wines were appropriately served. I was very surprised, however, at the lack of Port wine glasses, which was understandable since these professionals were not accustomed to this type of wine. 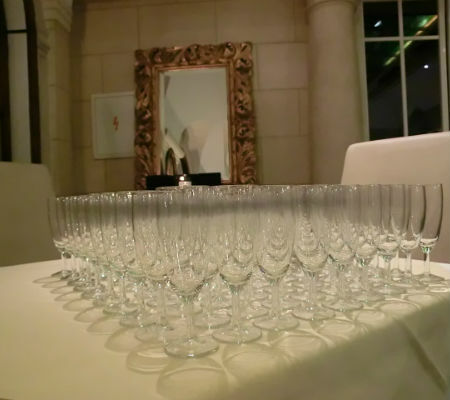 The last-minute solution was to use small champagne flutes, which provided a reasonable solution and did not affect the tasting. The tasting began with the Dry White and the Rosé, side-by-side. The Rosé had a slice of lemon that really livened it up. 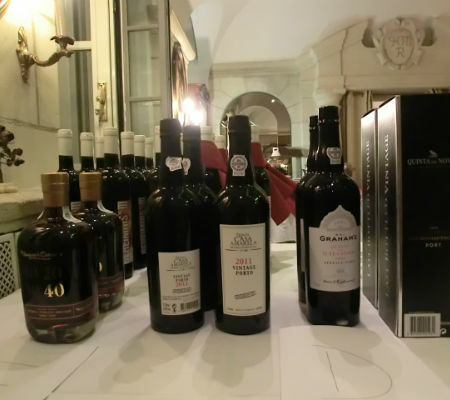 The other Port were tasted during the meal, between courses and during an explanation of the wines’ characteristics, the importance of serving temperatures, and the many harmonisation possibilities for each style. 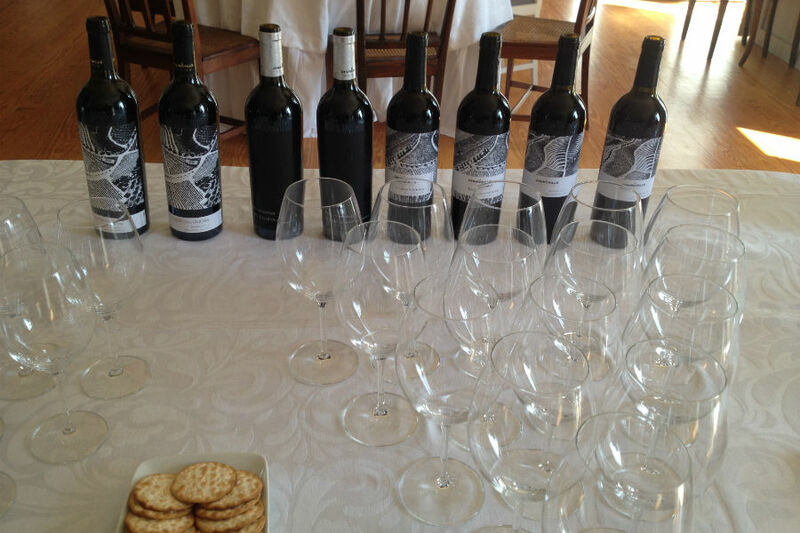 Thus, the Tawnies, the Ruby, the LBV and the Vintage wines flowed around the tables. In this case, the comparison was made between a recent Vintage (2011) and a 14-year-old Vintage (2001) that made a very good connection with the several chocolate and red fruit desserts the brothers savoured. 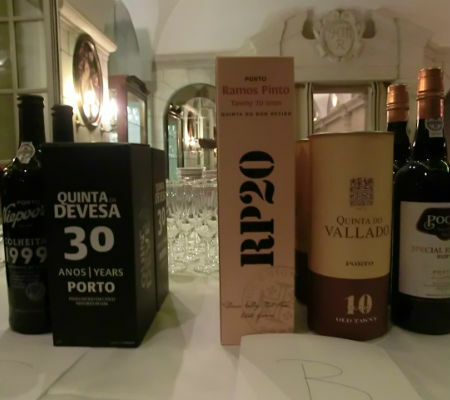 Finally, to end the tasting, we tried two 40-year-old Ports (White and Tawny), which were used to toast to the brotherhood and to Port wine. The other surprise of the night was that the one enthroned at the ceremony of the brotherhood … was myself!! 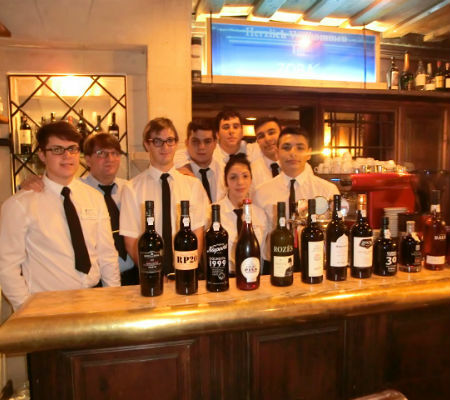 Here is the story of our experience and also a suggestion to IVDP and to producers to organise a small event in Vienna, a country that is open to new things, that knows Portugal well, but where there is still a lot of work to do for Portuguese wine, especially Port wine. I am once again tirelessly looking for novelty; I see this as a good excuse to carry on doing something I love: wine tasting. On a very recent occasion, amidst busy tables with bottles, somebody asked me if I knew the Blackett brand and its Port wines. 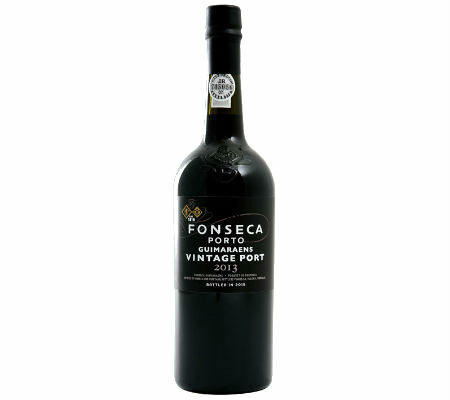 I smirked and said I hadn’t heard of it; that smirk snapped into a big smile when a bottle of Porto Blackett 30 Years landed right in front of me. These moments make us feel like a child who just got a new toy – in this case, a proper Tawny. Before I get more into the wine itself, I should say something about the person behind the wine, George Blackett, who was born in Leeds and settled in the city of Oporto in the 19th century as a Port wine tradesman. His positioning within the sector allowed for a remarkable progression, having made it to the top five biggest tradesmen of that century. His children later expanded on his trade, in the beginning of the 20th century, by linking up with maritime transport, which lead to the Blacket and Magalhães Company. Through time, this company that traded in Port Wine changed its name a few times: from Blackett e Companhia [and company], it was later renamed Blacket Sucessores [successors] until it was merged into a great company after World War II, more specifically in 1949. This name that had been lost in history was rescued by Alchemy Wines, Port Wines & Vineyards Ltd. and, in this case, it reveals a wine that was marked by the power of time, able to survive and to outgrow several generations, just as the purpose of this new company. This 30 year-old Blackett comes from vineyards whose age varies between 40 and 60 years-old; they are in Douro Superior sub-region and result from blending higher-quality wines aged in casks that are on average 30 years-old. I shall never question the majesty of Porto Vintage, but what I am most charmed by, and that which wins me over the most is a glass of Tawny Port; the older the better. 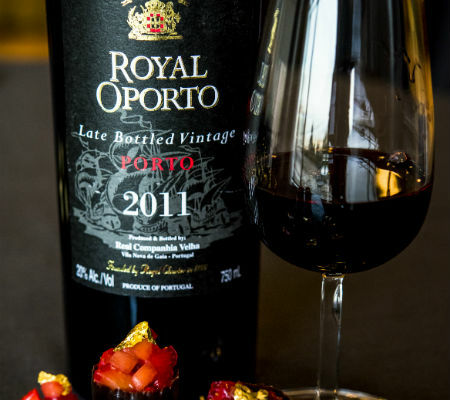 In my view, the soul and essence of Port Wine resides in the Tawny style. The plot is an art mastered by the person who plays the master blender, who is such a genius that he is on first name terms with every old cask siting in the vast cellars. That figure will almost always go unnoticed in the eyes of the consumer, knowing, however, that they can choose between hundreds of the casks he considers to be the best as if he were assembling a jigsaw puzzle; he can create true works of art. In this case, a Tawny 30 Years of beautiful complexity; very refreshing, with amazing clean aromas, tobacco, walnut, crystallised apricot, milk caramel, a hint of hairspray, a silky feeling in an ample, deep blend with a greedy end on the mouth. The way the youth and vigour of the younger wines are combined is all very precise given the complexity and education of the older wines that compose the blend. This type of wine is the perfect reward as it keeps you company at the end of a long day’s work.